CN plans to invest in 2018 to expand and strengthen the company’s rail network. 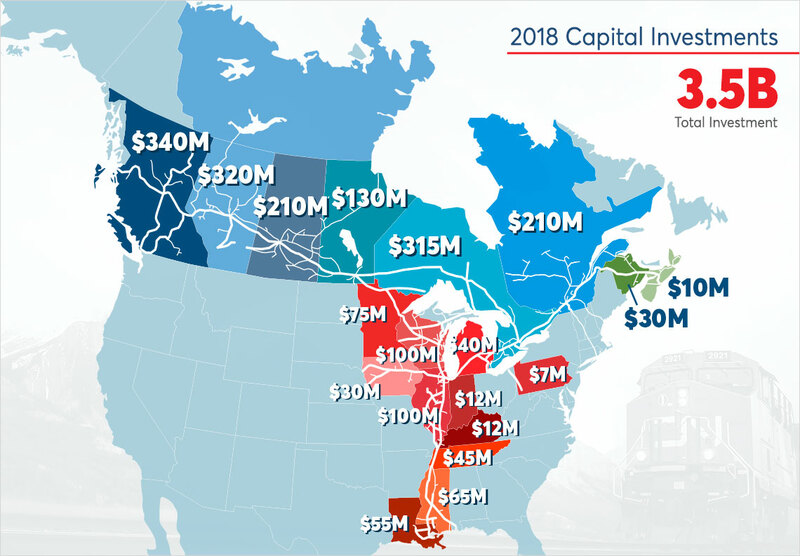 These investments are part of CN’s record $3.5 billion capital program and include key track expansion projects that will boost capacity allowing CN to better service our growing customers. Other program elements will focus on the replacement, upgrade and maintenance of key track infrastructure to improve overall safety, fluidity and efficiency. Installation of nearly 20 miles of new rail. Installation of more than 50,000 railroad ties. Rebuilds of road crossing surfaces and maintenance work on bridges, culverts, signal systems and other track infrastructure. Installation of nearly 6 miles of new rail. Installation of more than 2,100 railroad ties.